Madrid is a responsive, modern looking, based on Bootstrap PrestaShop theme, with built-in many amazing features, and the beautiful, detailed design. This is one of the best Responsive PrestaShop theme of 2015. The key feature in this theme is flexibility and theme options it is not only a few amazing predefined colors but also options where you can change Fonts, Colors, Layout and many other things, many possibilities give you a chance to create something unique on our new theme. Enable/Disable each of the module on Mobile/Tablets. Easily translate your theme to as many languages as you want directly from Admin Panel, no files editing! 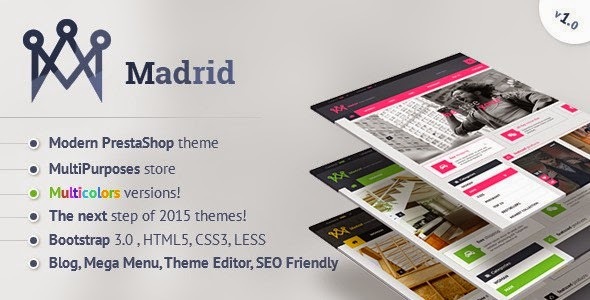 Item Reviewed: Madrid Modern Responsive PrestaShop Theme with Blog 2015 9 out of 10 based on 10 ratings. 9 user reviews.